Hart-Bradford House. Library of Congress. In the opening chapter of Lost Lexington, I wrote that Thomas Hart left to his wife a life estate "in the house and lot which I at present occupy." At first blush, one might believe that a life estate was given to his wife in the Hart-Bradford House that housed such significant history. But both Hart's last will and testament and its probate were after Thomas Hart had transferred, by deed, the residence at the southwest corner of Second and Mill streets to his son. 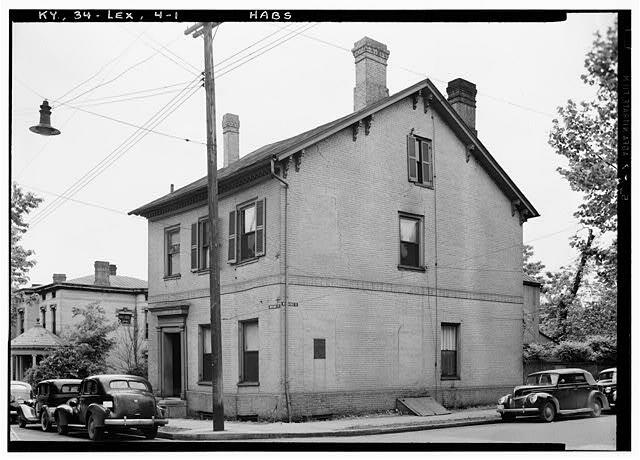 Thomas Hart left his wife a life estate in a different residence than the infamous home that was the site of Henry Clay's nuptials, the home of Laura Clay, and since the 1950s the site of a parking lot. Examining the historic places of Kentucky inevitably brings one to deed books and recorded wills that reveal much about the history of place. Sometimes, a last will and testament will reveal something about the testator (the person making the will) as well. Take for example, Henry Clay. Clay was a slaveowner having owned as many as 60 slaves during his lifetime. His will provided for his slaves manumission (or gradual emancipation) upon their achieving a certain age. The intent would be to ensure that each slave would be provided with basic shelter, food, etc. until they were 25 (females) or 28 (males). Further, Clay favored the removal of blacks from North America and their return to Africa. To accomplish this aim for his former slaves, Clay provided that "the three years next preceding their arrival at the age of freedom, they shall be entitled to their hire to wages or those years ... to delay the expense of transporting them to the one of the African Colonies." These provision, fortunately, have no place in a last will and testament today. But these lessons from the past are reminders for the present and for the future: estate planning is important no matter our circumstances. Even though estate planning is for everyone, the majority of Kentuckians (and Americans, generally) do not have their estate plans in order. This can create confusion after death with the disposal of property and the guardianship of minor children, and it can lead to unnecessary costs as well. Neither is something you want to leave behind for your grieving loved ones. 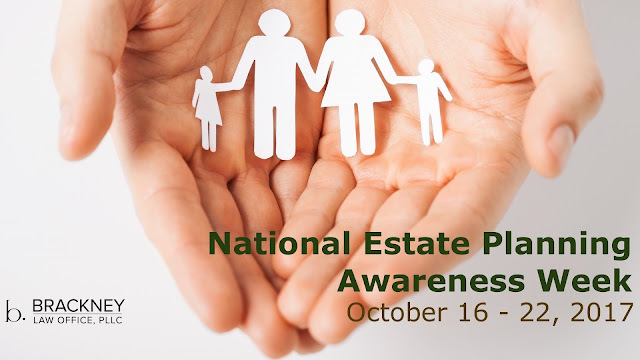 Congress recognized the importance of Estate Planning and proclaimed the third week in October as National Estate Planning Awareness Week. In 2017, that's October 16-22. Every adult (especially those with children!) should have a will, a power of attorney, and their healthcare wishes properly written down. For many, setting up a trust is also an important part of planning. Everyone has a unique situation and it is important that everyone have a tailored plan. In 2009, I started the Kaintuckeean and I also started practicing law here in the Commonwealth of Kentucky. In my practice, I believe that estate planning is for everyone. To learn more about estate planning, national estate planning week, a special offer, and what you need to do next in order to get your estate plan crafted - just visit BrackneyLaw.com.